Michael N. Kalantar’s book, Russia Under Three Tsars, has been a project for me ever since I discovered the typed manuscript in the wall of books on Russian history at my mother’s h ouse four years ago. Sadly, this was after her death, so I couldn’t ask her about a literary work I had never known existed. Dr. Kalantar was my father’s cousin and my godfather. I knew him simply as a kindly old man who gave me Madame Alexander dolls (very fancy!) and sterling silver spoons (also fancy, but hard to play with). He died in 1958, when I was a child. I never knew until recently that he had been a writer all his life. After graduating from an impressive series of universities, ending with the Sorbonne, Dr. Kalantar entered the tsarist government service at one of the most crucial moments in Russian history, when the Duma, the Imperial Senate, was formed. The Duma was an attempt to have a legislative body, to quell the massive public unrest with lack of reform during Tsar Nicholas II’s reign. Dr. Kalantar rose to be Secretary-in-Chief of the Duma and became privy to information others never knew. Russia Under Three Tsars covers the period from Tsar Alexander II’s tragic assassination (he was a reform monarch who was about to do great things for his country) in 1881 to around 1911, when the final crisis of tsarist rule was on the horizon but had not yet taken place. According to a cover letter I found with the manuscript, which had been submitted to a publisher sometime in the 1950s, Dr. Kalantar wrote more about later events, including the revolution of 1917, but so far I’ve not been able to find any trace of such writings. He was not yet born when Alexander II was assassinated, so how did Dr. Kalantar know in such intimate detail the various events and people involved on that fateful day? His uncle, Count Loris-Melikov, was Alexander II’s reform minister. It is safe to say that Loris-Melikov was at least the partial architect of the reform law the Tsar was about to publish before his supremely untimely death. Dr. Kalantar had exclusive access to the Loris-Melikov banned, untranslated, raw memoirs, from which he wrote his stirring account of Alexander II’s assassination, and which provided many other details only known by people close to the imperial court. Years later, of course, the private diaries of royal personages became available to scholars, so Dr. Kalantar added frank items recorded by these people. Such intimate access to the seat of power, and the ability as a scholar to synthesize many accounts, is what makes this history of value even though it is incomplete and despite the many decades that have passed since the events it describes—and the many decades since it was written, as well. 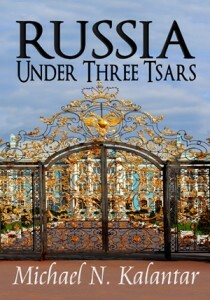 There are other eyewitness accounts of the last days of the tsars, but there can never be enough. It’s a fascinating and tragic period of world history. For those who are interested, every newly discovered account is very welcome. Dr. Kalantar’s history is written by an unapologetic tsarist, which again is welcome because we get a true sense from someone who knew the Tsar just what he was like and how people viewed the Tsar and the various people involved in his life. I was very impressed with the manuscript. Dr. Kalantar’s command of the English language was nearly faultless despite English being far from his first, or his second, or even his third language. There were no egregious grammatical errors. The story flowed. It was immensely readable. And it was about larger-than-life, charismatic royal figures, people who glittered and yet who were human, too, as Dr. Kalantar described both their public and their private moments. It’s a compelling story as he tells it. I scanned every typewritten page, OCRed them, and regularized the spellings of proper names since there are various ways to approximate Russian alphabet letters in English. I did not attempt to edit the sense or style of this historical account, nor comment on Dr. Kalantar’s opinions. It’s his history of a crucial time, his opinion and interpretation and synthesis of the facts, worth reading as an historical document, an eyewitness account. Russia Under Three Tsars is available as an ebook and trade paperback at Amazon, iBooks, Kobo, Nook Press, and Barnes & Noble, as well as other venues.